BERTILO, the Abbot of St. Benignus Abbey in Dijon, France. St. Bertilo was circa 883 martyred at the altar of the Abbey church along with some of his monks during a sack of his abbey by Vikings. BRAULIO, a monk at the Monastery of St. Engratia in Zaragoza in present-day Aragon, Spain. St. Braulo succeeded his brother, John (who had ordained him to the priesthood), as Archbishop of Saragossa. In addition to his customary duties as bishop, St. Braulio served as an advisor to the monarchs. A fierce foe of Arianism St. Braulio successfully converted many Visigoths to Christianity. St. Braulio reposed in 646. CASTULUS, a chamberlain in Diocletian’s palace in Rome and husband of St. Irene of Rome (30th March). In 288, St. Castulus was arrested, tortured, and then buried alive for having provided refuge to fellow Christians. FELICITAS of PADUA, a ninth century nun in Padua, whose relics are enshrined at the Basilica of St. Justina in Padua, Italy. FELIX of TRIER, though the records of the Church in Trier were destroyed by the Normans, we do know that St. Felix was in 386 consecrated the thirty-third Bishop of Trier by St. Martin of Tours (11th November). A fervent opponent of Priscillianism, St. Felix reposed in 400. GARBHAN, (Seventh Century), nothing certain is known about this Irish saint, though he seems to have left his name to the town of Dungarvan (Dún Garbháin) in Co. Waterford, Ireland. LUDGER, The Apostle of Saxony, a native of Frisia, who spent some time in England and at Monte Cassino. He preached mainly in Westphalia and served as the founding Bishop of the See of Münster. St. Ludger authored a Life of St. Gregory of Utrecht (25th August). He reposed in 809. MOCHELLOC (CELLOG, MOTTELOG, MOTALOGUS), (Seventh Century), the patron saint of Kilmallock (Cill Mocheallóg) in Co. Limerick, Ireland. There are no reliable details of his life extant. MONTANUS and MAXIMA, Montanus, a priest, and Maxima, his wife, martyred by drowning during the Diocletianic Persecution, 304. 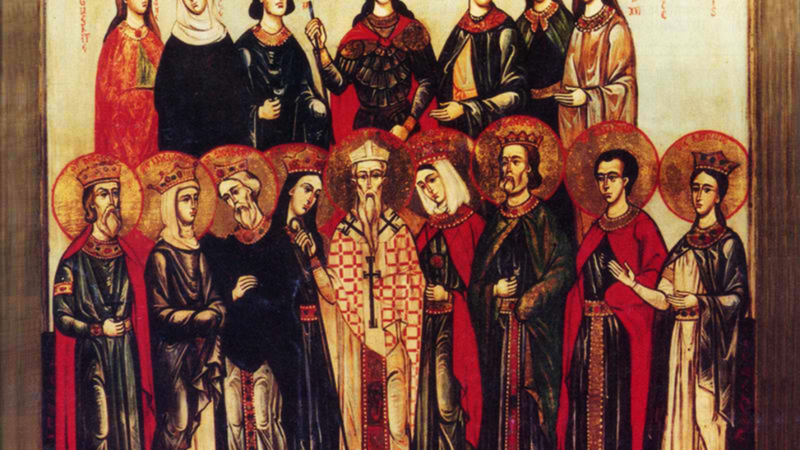 PETER, MARCIAN, JOVINUS, THECLA, CASSIAN, and COMPANIONS, (Date Unknown), a group of martyrs in Rome whose lives have become hopelessly intertwined that it is now impossible to disentangle them. It is said that some of them may have been bishops. SINCHEALL, (Fifth Century), a disciple of St. Patrick (17th March), and founder of the monastery of Killeigh in Co. Offaly, Ireland. At its peak, there were one hundred and fifty monks at the monastery. There is no further information on this saint extant.